"Blue Skye & Growing Self-Reliance"
Aubrey Skye is proud of his heritage as an enrolled member of the Standing Rock Sioux Tribe. For some years he attended boarding school and lived in Phoenix, but ultimately he felt the call to return home to the Standing Rock. Good things are happening on this land that spans the North Dakota-South Dakota borders. Aubrey works for the Standing Rock Sioux Tribe’s Diabetes Program and is helping in the fight against diabetes. This is why, for two years running, Aubrey took on a huge garden project for the reservation, as the Diabetes Program’s Native Gardens Project Coordinator. 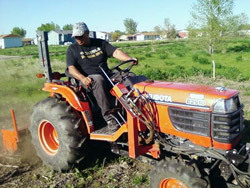 Over 130 families on the reservation wanted to raise a garden. Through AIRC Project Grow, their gardens were tilled and a variety of seeds, including traditional seeds, were provided to get their gardens started! Aubrey was first introduced to gardening and agriculture through his stepmother’s family. They grew organic crops, but didn’t call it “organic” back then. Each year, they burned off the weeds, because the ash added nutrients to the soil. Aubrey followed the tractor to sow the seeds and cover a row at a time. It paid off every year. Coordinating the tilling of 130+ gardens is no small task on Standing Rock. The reservation is wide. There are many miles to be driven to get from point A to point B. Locating the homes for the garden plots is also tricky. “It’s like… turn left at the telephone pole, go two miles to the end of the field and take a right, and go a mile and a half and you’ll see a trailer out there.” This is what Aubrey has to go by, but it’s easier each year as they become more familiar with the families and the homes. Aubrey’s garden project is working on many levels. Gardening was a big deal back in the 1930s to 1940s before the Army Corps of Engineers built dams and flooded the Missouri River bottom where Standing Rock’s people lived. This forced the tribe to move further back on the prairie. The soil, Aubrey explains, is basically a buffalo range, all grassland, but gardening can be done and the people here are interested in growing crops. 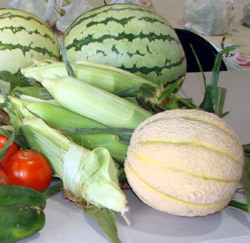 In addition to the garden project, Aubrey, the SRST Diabetes Program, and the CDC Native Diabetes Wellness Program are encouraging tribal members to eat wild edible foods and to vend these foods at the 3 Farmer’s Markets on the reservation. Native Americans once made their living and got all of their sustenance from game and wild foods. Modern day raw foodists believe that wild edible foods are the most vital of all foods and can't learn enough about them! Aubrey says, “These are ‘traditional foods’ that we used to eat all the time.” They grow abundantly on the reservation and provide a sustainable source of variety in the diet. Examples are the tinpsula (edible wild turnips), choke cherries, buffalo berries, wild currants, gooseberries, wild turnips, and more. Aubrey Skye is the Native Gardens Project Coordinator for the Standing Rock Sioux Tribe’s Diabetes Program.